Updated Tuesday January 3, 2017 by Brookwood Athletic Association Baseball & Softball. Each team should have 10 players on the field with the 10th player being an outfielder. There is no leading off base, stealing base or bunting. Bats - See All League Rules for Bat Equipment Guidelines - This is a wood bat league - wood bats only. Batters are allowed 4 pitches from the machine. Batters will be called out on the third strike or fourth pitch whichever comes first. On the fourth pitch, the batter may foul off as many pitches as necessary until a pitch is missed or hit fair. 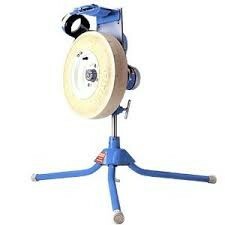 The pitching machine will be set at 35mph. There shall be no practice pitches once the inning begins. The machine may be adjusted before each half inning with a maximum of five practice pitches. Any ball that hits the pitching machine or the pitching coach is ruled a dead-ball single. All runners will advance one base only. The machine may be adjusted if necessary. Pitchers must have one foot in the pitchers’ circle as the pitch is delivered. An exception may be made if the batter is a particularly strong hitter and both managers agree. The pitcher may move to the area between 2nd base and the pitchers circle. After a ball is batted, no player may leave their defensive position to take the place of a catcher unless the catcher is injured during the course of the play. Backing up a play at the plate is acceptable. The field will be split into four imaginary triangles each one having the pitching rubber as its apex and the baseline is the hypotenuse. This will be used to determine which players are eligible to make plays in each baseline. If the umpire decides that a play that would be considered a typical "baseball" play, then the play will be allowed. This is a judgment call and thus, not contestable by a manager. As part of this rule, the player assigned to the position - i.e. a 3rd baseman - must be the player that accepts the throw from another player. For instance, the Shortstop, cannot run over from his position to recieve a throw at 3rd, IF the regular 3rd baseman is available to receive the throw. Extending this example, the obvious "baseball play" exception is if the 3rd baseman was pulled away from the bag trying to field a ground ball or is otherwise out of position, and the natural progression is for the pitcher or shortstop to cover the base and receive a throw. 1. While fielding a ball, a player outside of the triangle comes within close enough proximity to a runner that an MLB player would tag the runner versus throwing to a base. 2. In a rundown situation, any player outside of the triangle may participate. The intent of this rule is for the players to develop skills in throwing and catching a baseball as opposed to running across the field to tag runners. When the lead runner is forced to stop on, or return to a base under threat of an out, the ball will be considered dead and time will be called by the umpire. Throwing the ball to the pitcher does not stop play. Coaches: 5 coaches/adults are allowed within the confines of the field and dugout. Only the base coaches are allowed to give instructions to the runners. The pitching coach may direct a batter, while he is in the batter’s box, to move out, in, up or back. Once the ball is hit into play, the pitching coach may not speak to the runners, and should remove himself from the defensive playing area if possible. If the ball is hit over the fence, the coach may not assist the player around the bases. This does not include a pat, handshake, or minor show of congratulations. All players on the team at bat, except the on-deck hitter, must remain in the dugout. No base on balls or free base for hit batters. There will be one warning per player for slinging the bat or throwing a helmet. There will be one warning per player for removing a helmet prior to entering the dugout. Next violation for that warned player will be considered an immediate out. There is no special appeal rule by the manager. For example, if a runner misses second base and the umpire sees it, the runner is out; if the umpire does not see the runner miss the base, the runner will remain safe. In the event of a play at a base other than first that involves the ball, the runner, and the defensive player arriving at the same time, the runner must slide or avoid contact or be called out.